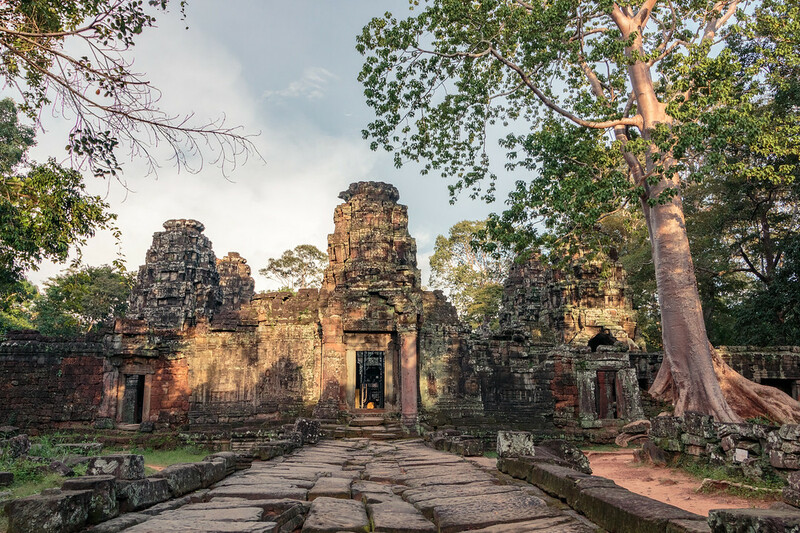 The temples of Angkor in Cambodia were, without a doubt, on top of our list for Expedition 100, our interactive web-series showcasing the top 100 most amazing places in the world. 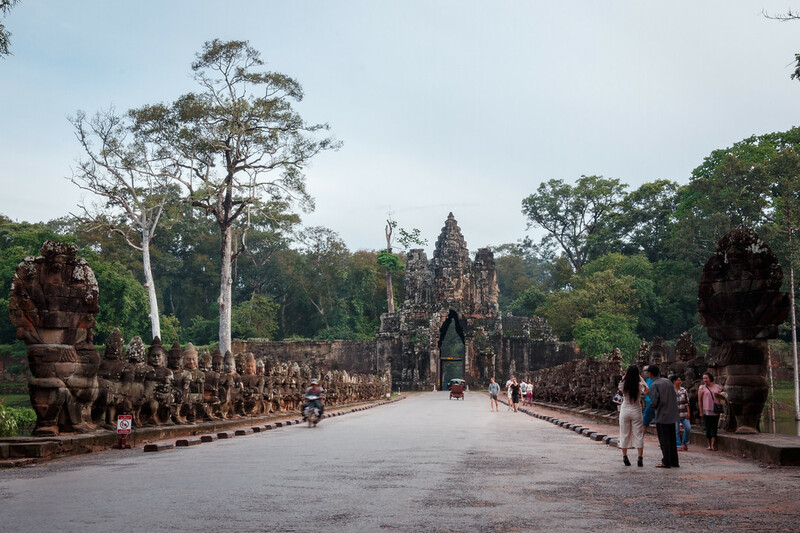 The Angkor Archaeological Park is one of the largest religious complexes in the world and certainly one of the most iconic, with the famous temple of Angkor Wat. 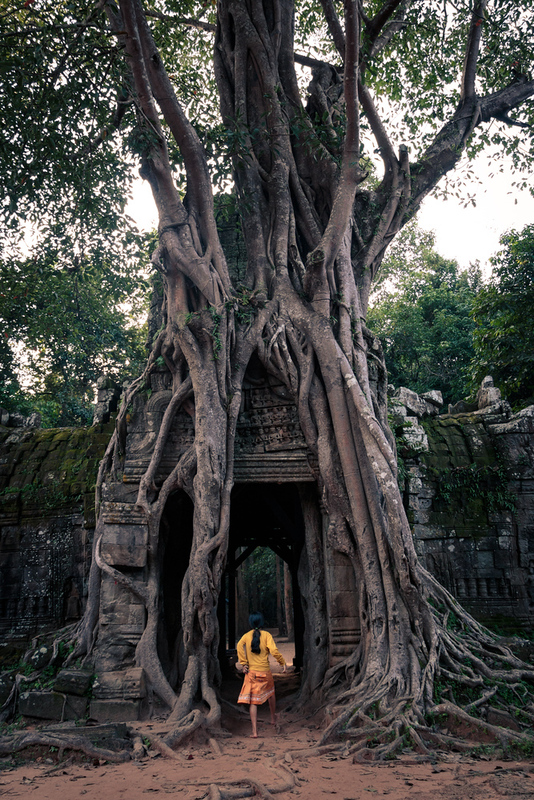 There are over 2 million visitors each year making their way to the temples of Angkor. In 1992, after the complex was listed as a UNESCO site, there were over 2000 visitors per year. While this exponential growth can have huge benefits for the local communities and the country, it’s already causing threats to the temples. 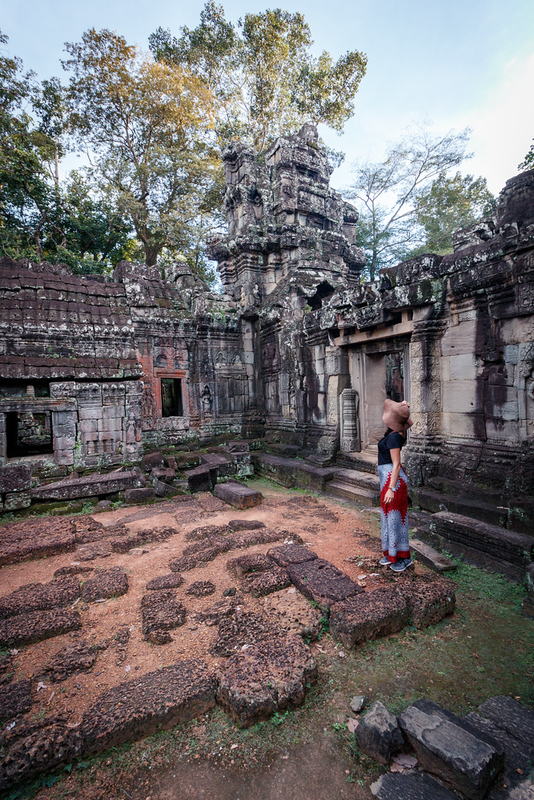 Is tourism a good thing for the temples of Angkor ? Probably not. Should you go there ? Yes ! The solution to environmental issues to me is never about forbidding but regulating and offering alternatives. Since we care about our planet and about our common cultural heritage, we tried to show you ways you can use to be a more sustainable and responsible tourist while visiting one of the Wonders of the World. Here is a practical guide with useful informations to visit the temples of Angkor in a sustainable manner. 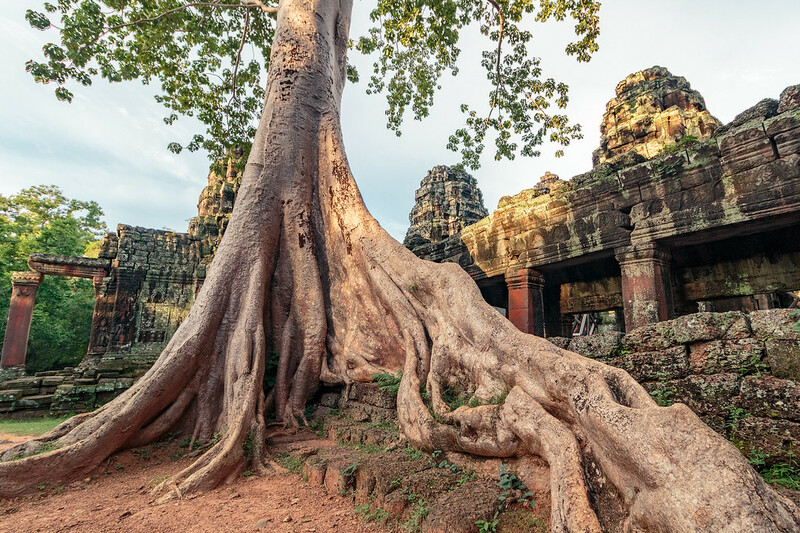 When is the best time to visit the temples of Angkor ? How to dress to visit the temples of Angkor ? 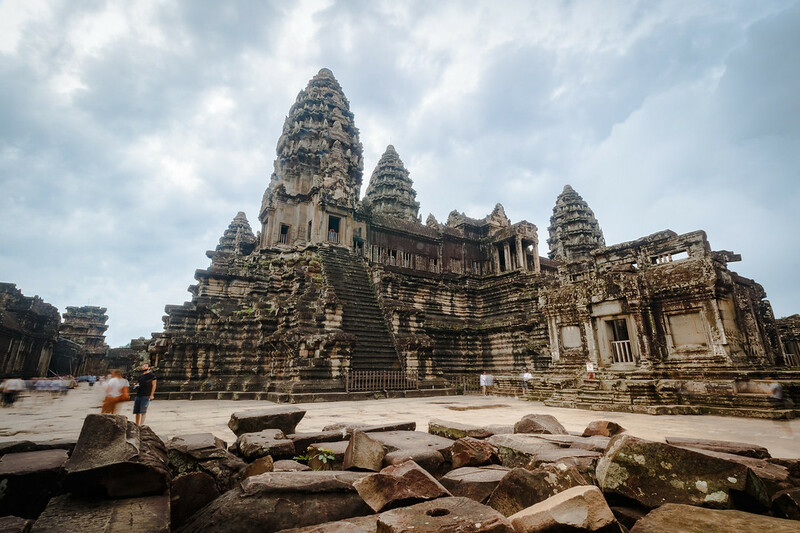 Although I am not an expert and could not possibly tell you the full history like a real travel guide could, I could not start this article with a little bit of history and a few facts about the temples of Angkor. With a total surface of 401 km2, the Angkor Archaeological Park is the largest and oldest religious complex in the world and one of the ancient seven Wonders of the World. It was listed as a UNESCO World Heritage Site in 1992 for its outstanding universal values. Angkor used to be the flourishing capital city of the Khmer Empire from the 9th to the 15th centuries, ruling over almost all Southeast Asia. Angkor Wat might the most famous temple of Angkor, but the complex is made out of over one thousand temples. Here are a selection of some of our favourite temples, and also the most popular ones, with photos and facts. 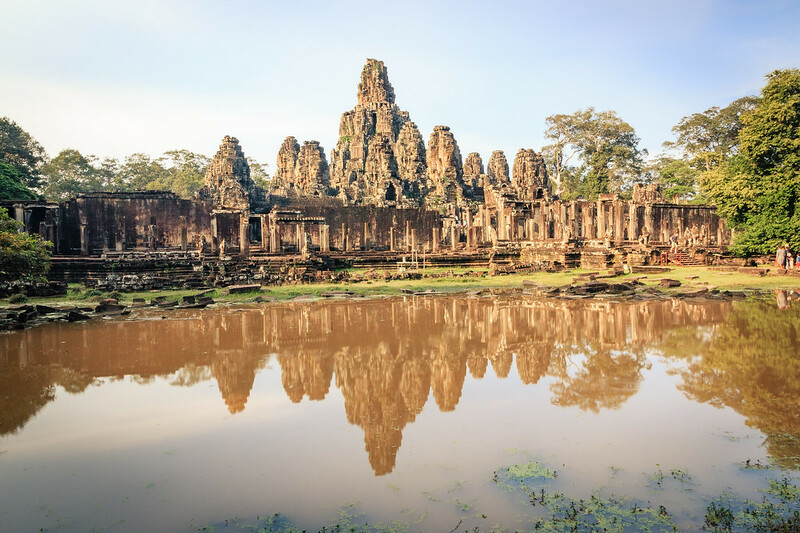 Angkor Thom was built in the 12th century under the reign of King Jayavarman VII, primarly to serve as a walled city to defend the inner temples, such as the Bayon. Five monumental gates guard the entrance to the city of Angkor Thom, one for each cardinal direction except the East which has two. South Gate is the most popular with tourists. Angkor Wat was a Hindu temple dedicated to the God Vishnu, and built between 1113 and 1150 by King Suryavarman II as his state temple and capital city. Spreading over 200 hectares, it is one of the largest religious monuments ever constructed. It is such a Cambodian landmark that it is the symbol of the country and appears on the national flag. 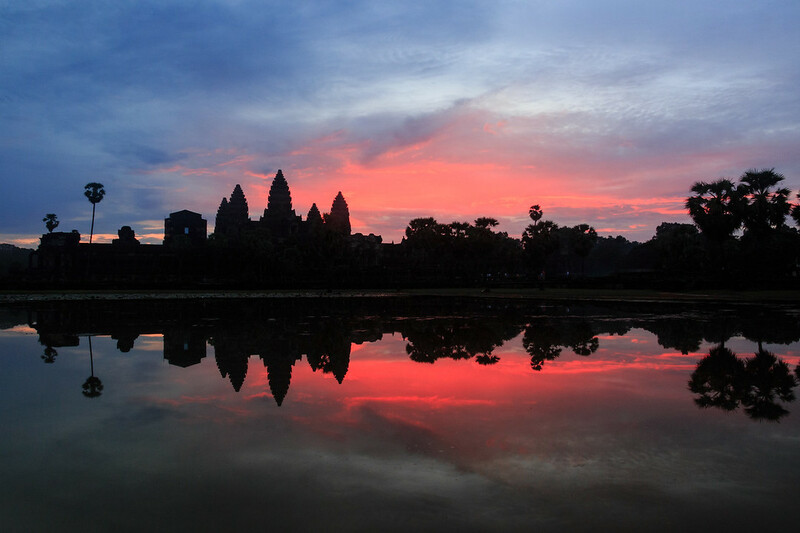 Angkor Wat Sunrise is probably the most beautiful sunrise you will see in your life, so make sure you arrive early, go to the left side of the reflection pond, secure your spot, bring a stool or a towel to sit down while you wait for the show ! 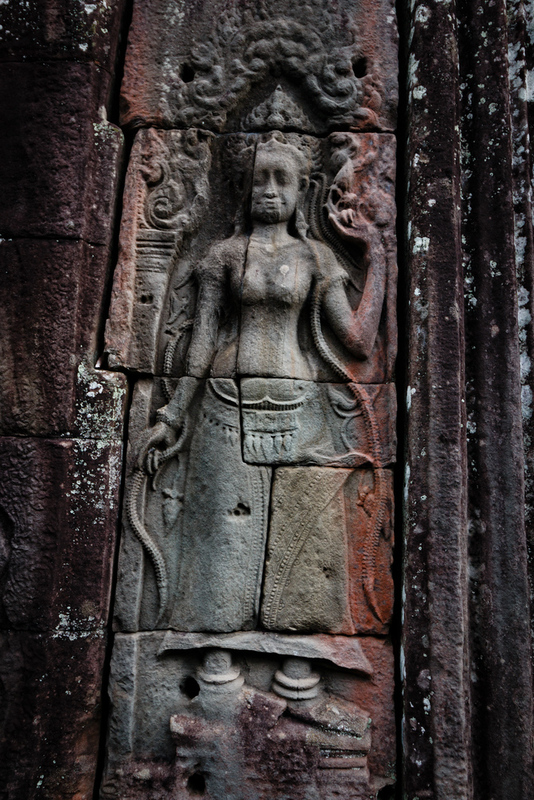 Banteay Kdei is a Buddhist temple built at the end of the 12th century under the reign of King Jayavarman VII. It might not be one of the most popular, but we particularly loved its architecture and the trees growing over its stones. Bayon temple is a Buddhist temple built at the end of the 12th century by King Jayavarman VII. 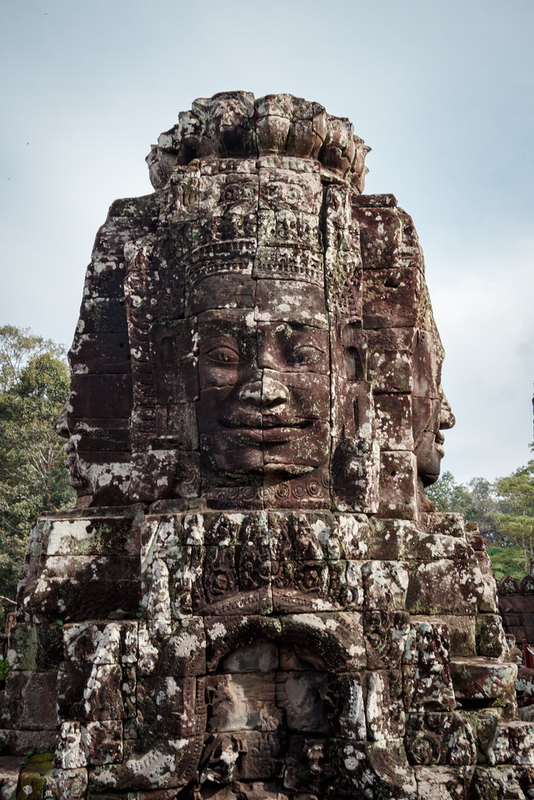 It is famous for its massive smiling Buddha faces sculpted on its towers and for its stunning bas-reliefs depicting the life of the Khmers and mythological scenes. Make sure to arrive before 8am as it gets crowded very, very quickly and the visit won’t be as nice with all the group tours taking selfies with the Buddha faces ! “Phnom” meaning “hill”, Phnom Bakheng refers to the temple as well as the hill where it is built on and overlooks Angkor Wat and the Western Baray. This Hindu temple was built in the 10th century by King Yasovarman I. Today, it is a popular spot to watch the sunset. Note that tripods are not allowed and that there is a limited amount of people allowed at the top, so make sure to arrive around 4 pm to secure your spot ! Prasat Kravan Temple is a Hindu temple built in the 10th century under the reign of Harshavarman I. The use of bricks makes it quite interesting and unique amongst other temples in the Angkor Complex. It’s a small structure so it’s a quick stop on your way to other temples. 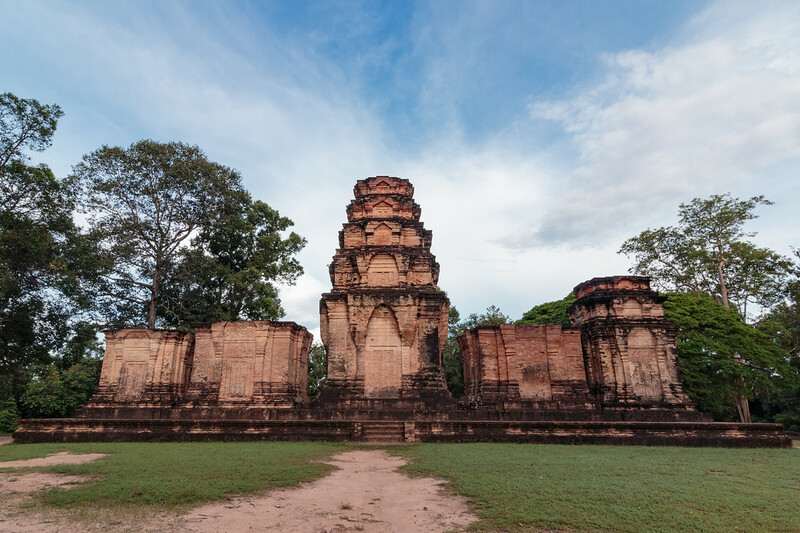 Built in the second half of the 10th century by King Rajendravarman, Pre Rup temple was constructed on a pyramidal base, with five sanctuaries on the ground level, twelve on the second level and five towers at the top. Today it is another great spot to watch the sunset but also best to visit at sunset to get a beautiful golden light illuminating this monument. Again, you should arrive early to secure a good spot. It might not be as popular than the sunset from Phnom Bakheng but it’s still a popular spot for sunset in the Angkor complex ! This Buddhist temple built in the 12th century by King Jayavarman VII served as a Buddhist university. 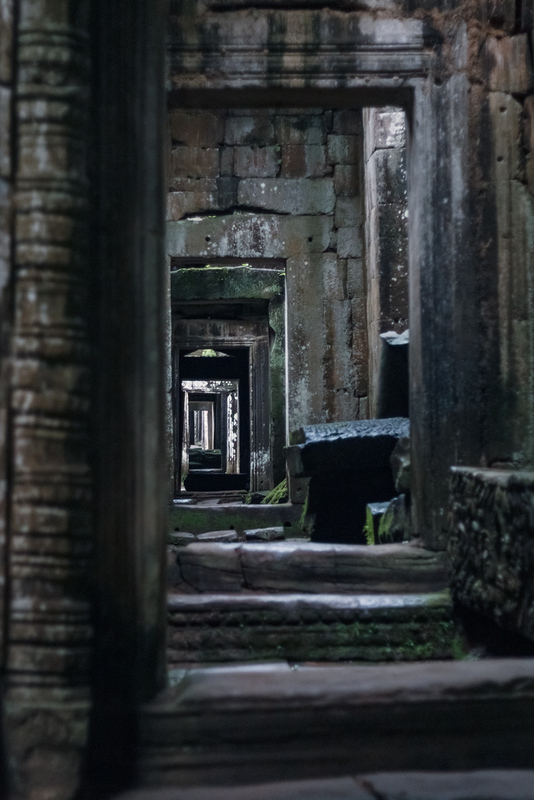 The name “Preah Khan” means “Sacred Sword” referring to the divinity it was dedicated to. Make sure to enter through the South Gate as it truly feels like you’re a 19th century explorer discovering the temple in the middle of the jungle ! Ta Prohm temple is a Buddhist temple built in the 12th century by King Jayavarman VII. Its original name was Rajavihara, the royal monastery. It is massively invaded by spong trees, taking over the stones and bringing this sense of nature taking over man-built monuments. If you’re a fan of the movie Tumb Raider, you will probably recognise this temple as the movie set ! 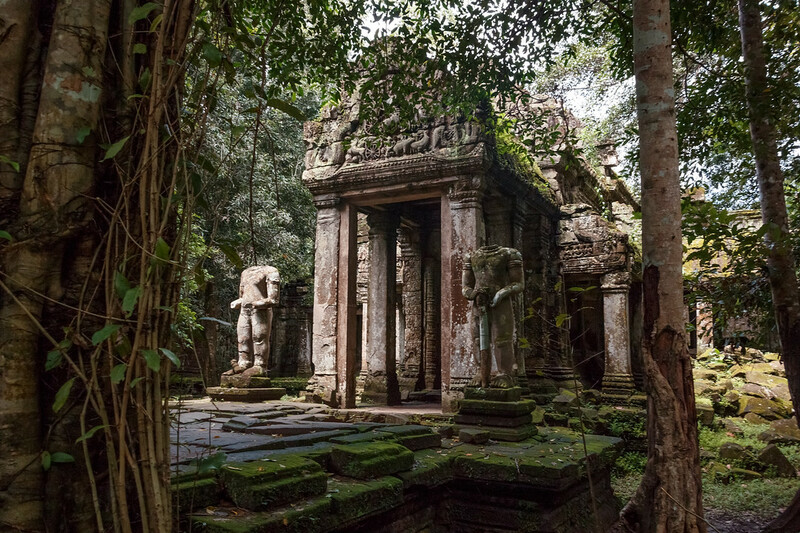 Built under Jayavarman VII in the 12th century, Ta Som Temple is a Buddhist temple located further away from the most visited temples in the complex and yet well worth a visit. Do not miss its spectacular tree and carved stones. 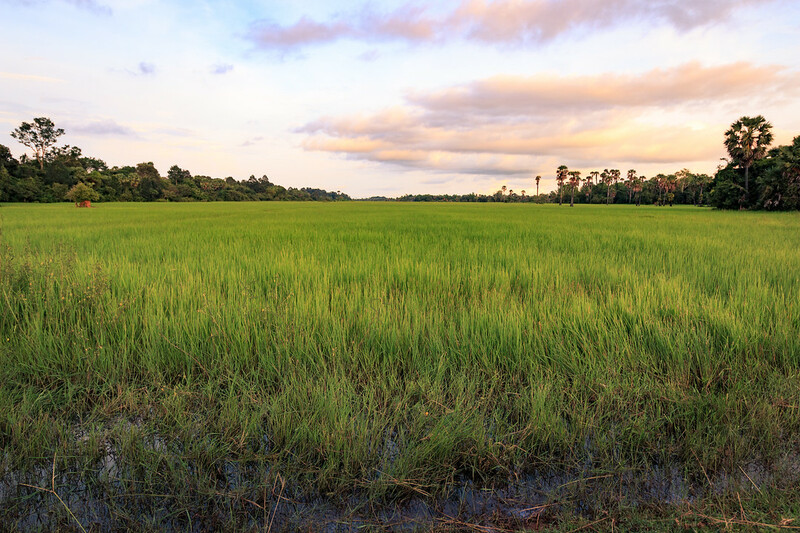 The Angkor complex has so much more to offer than its temples, it is an ecological site as well, home to many plants and birds species, and offering a wide range of natural landscapes from ponds and wetlands to rice fields and forests. Angkor Archaeological Park houses also villages, more than 100000 people live around the area. Driving my e-bike through the off roads and rice fields inside the Angkor complex was one of the highlights of my visit of the temples. Unfortunately, elephant riding are popular in Southeast Asia and Angkor is no exception. Riding an elephant might have been an ancestral tradition in many countries in this part of the world, it has become so popular that wild elephants are being hunted and killed to steal young babies and train them to be ridden. The hard process the elephant has to go through in order to accept people on its back is inhumane. It is called “soul crushing” and the name illustrates well the horror the animals go through. The elephant’s back is not as strong as you would think, and cannot support the weight of a nacelle and people in it. They live a life of prisoners, chained, unable to move freely, until they get too old and get sold to a sanctuary where they can finally live peacefully. Be a responsible tourist and say no to elephant riding ! If you want to learn more about why elephant riding is to be avoided, watch this video. KKO (Khmer for Khmer Organisation) is a german-cambodian charitable NGO, founded in 2009 and located in Siem Reap. Their goal is to offer a better future to Cambodian children and young adults, by offering qualitative education. 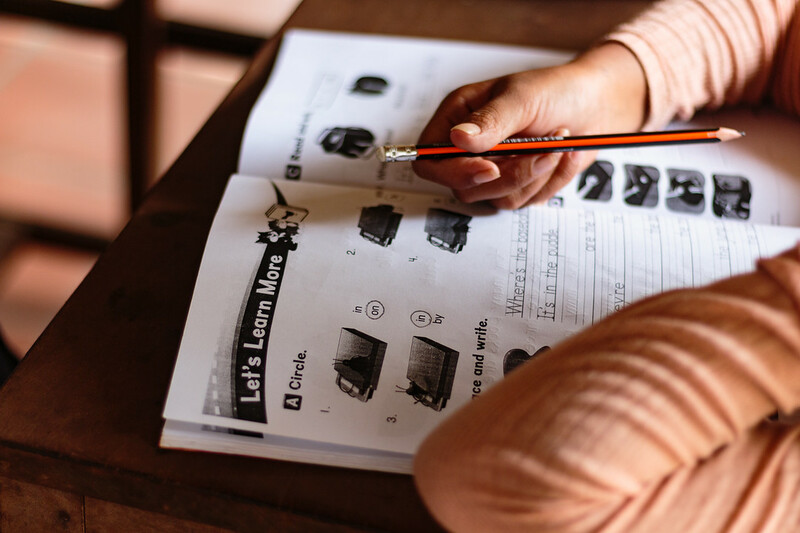 Since mastering English is such an important skill to have in the tourism sector in Cambodia, KKO offer English classes for children and young adults, as well as sewing classes and motorbike mechanics training. Students are given the tools to create their own success whether it is landing a job or creating their own business. They also created their own fair fashion label called OFF Track Accessories. 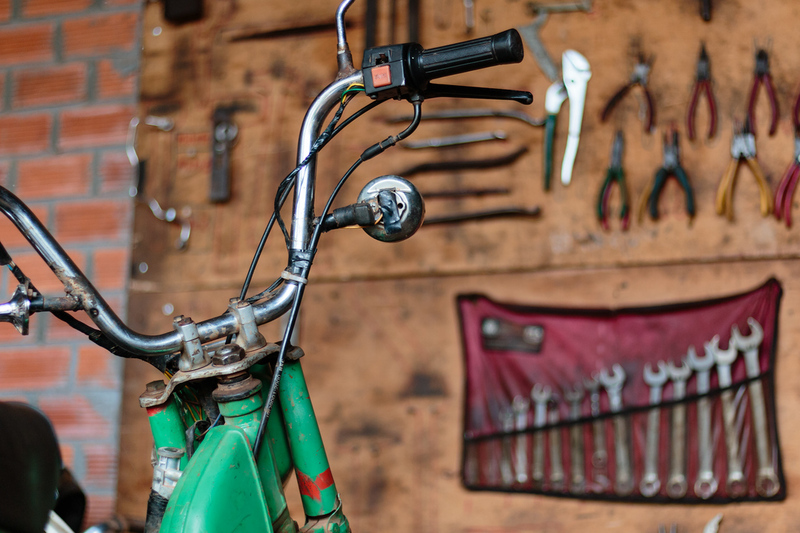 Products are made by students who trained with KKO, using ecological and upcycled materials such as car, bicycles and motorcycles tires and tubes. In order to manage those social projects, KKO created their own tour company, OFF Track Tours and Travel. 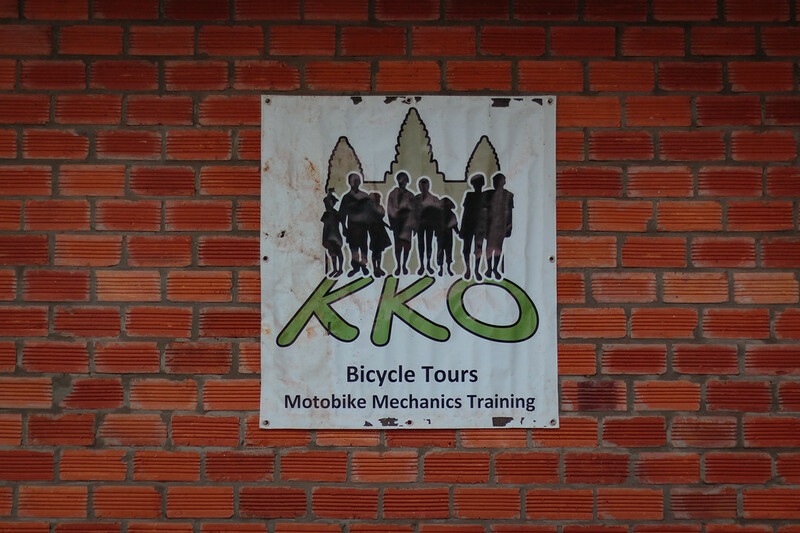 They provide off the beaten paths bicycle, motorbike and trekking tours to the Angkor Complex and the surrounding countryside of Siem Reap with well trained local tour guides, who often went to the KKO school to learn English. 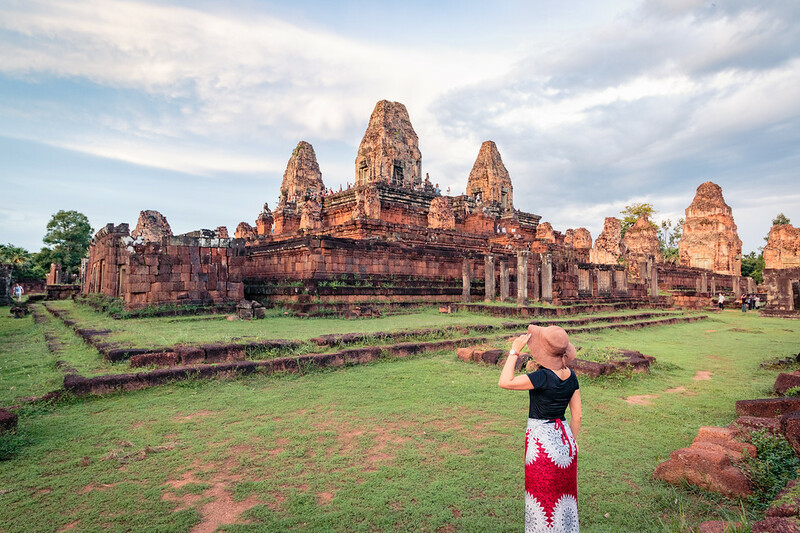 These tours are an amazing way to discover the real Cambodia, by exploring the Angkor Archaeological Park away from the tourists crowds as well as exploring the countryside around Siem Reap. What we like about KKO and OFF rack is that all the money they got from the tours and their shop directly to their NGO. So by booking a tour with them or buying a product at their store, you contribute to their educational and social projects. Offtrack Tours offered us to do two tours with them, a Sunset Angkor Tour and a Cycling tour of the Siem Reap countryside. Both were lead by an experienced and friendly English-speaking Cambodian guide, named Chy ! Thanks to him, we were able to go explore the temples in a way that not most visitors do, going on trails that we won’t have found by ourselves and seeing a different side of the temples. He also taught us a lot about the history and the culture, things that we would not have known by visiting on our own without a guide. 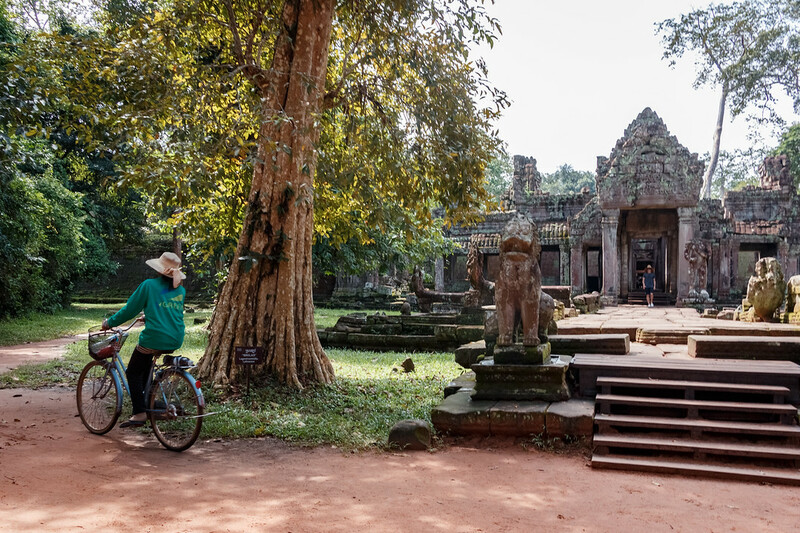 We particularly enjoyed riding our bicycles through the jungle and arriving at the secret (but not so secret) entrance to Preah Khan temple, where we felt like we were 19th century explorers discovering the temple for the first time ! 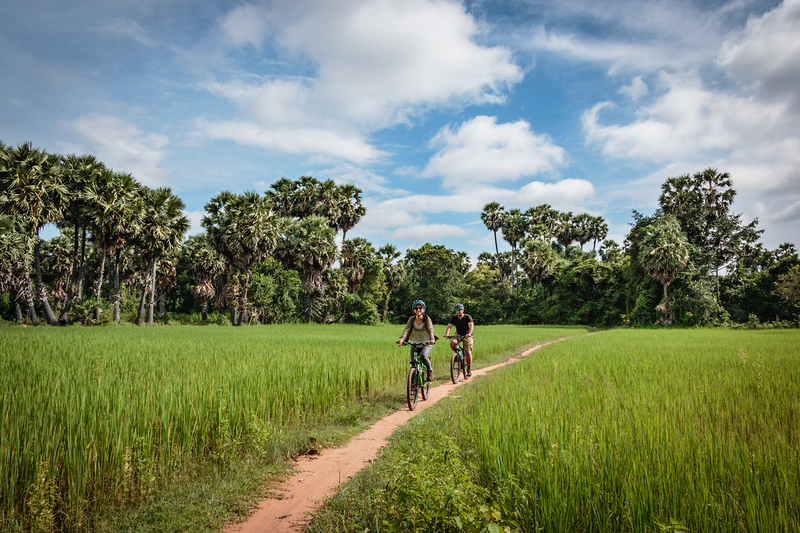 Cycling around the Siem Reap countryside also was a highlight of our trip, as we encountered the real Cambodia. 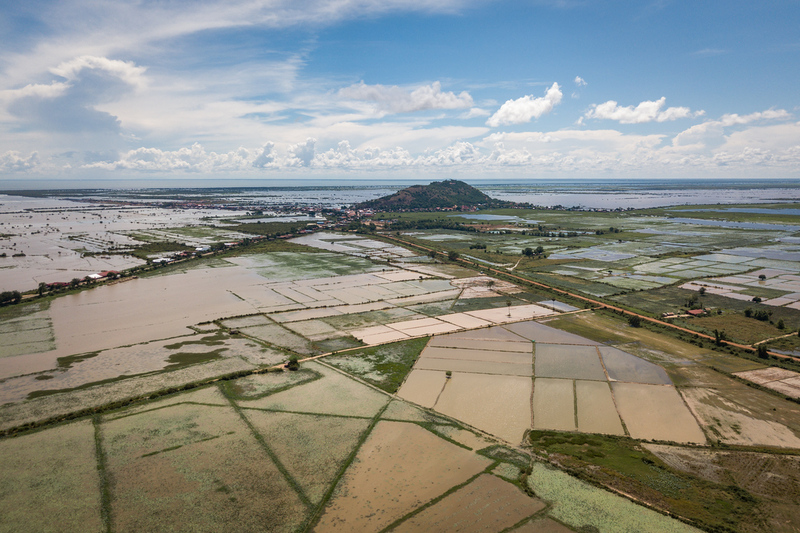 Chy guided us through rice fields, local markets, beautiful lotus fields, pagodas and villages, while teaching us a thing or two about Cambodian culture. And we also got to visit the KKO School and mechanics training, as well as their sewing workshop. 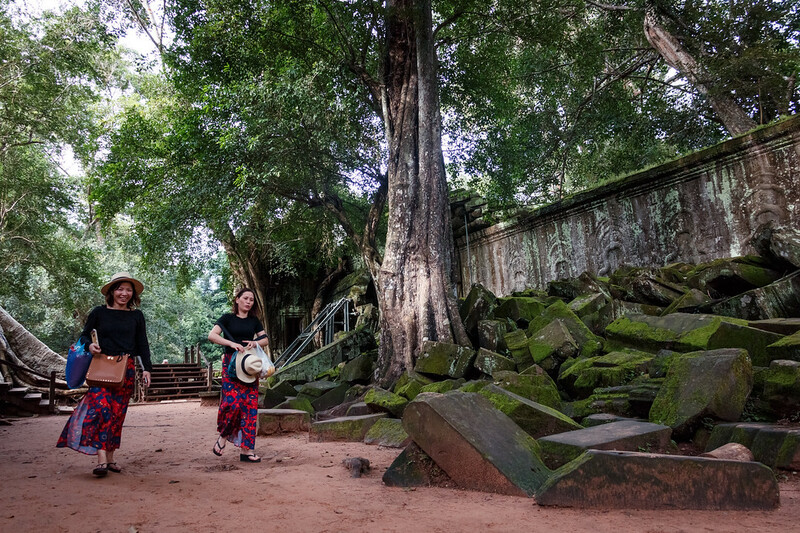 If you want to visit the temples of Angkor off track, away from the crowds while having a positive impact on the local community then book a tour with them ! We tried several way to go from Siem Reap to Angkor and around the temples. 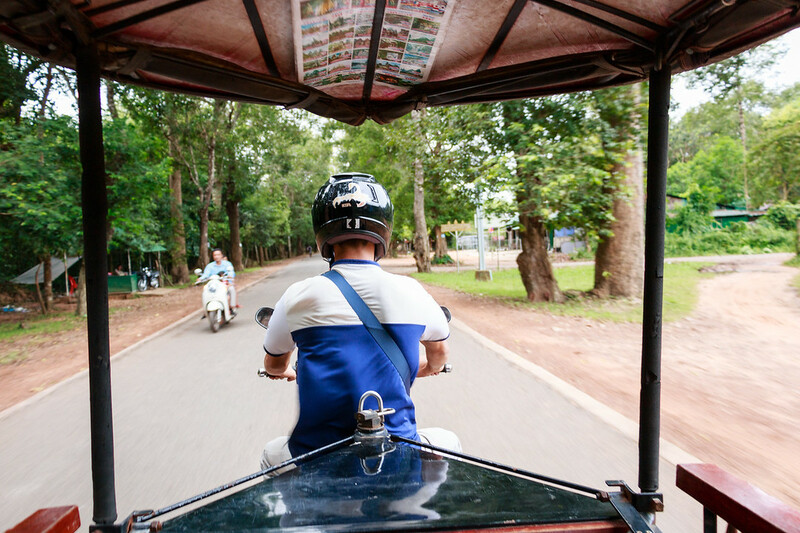 From bicycles, to e-bikes, motorbikes and tuk tuk, we tried almost all of them ! Two of them are more sustainable than the others, cycling and renting an e-bike. Renting a bicycle is a great way to go to Angkor from Siem Reap and get around the temples sustainably. And, you get to do some exercise ! You can rent a basic bicycle with a basket in central Siem Reap for 1-2$ per day. If you can afford a bit more, I would suggest hiring a mountain bike for 5-6$ per day. It will be much more comfortable and less tiring at the end of the day. 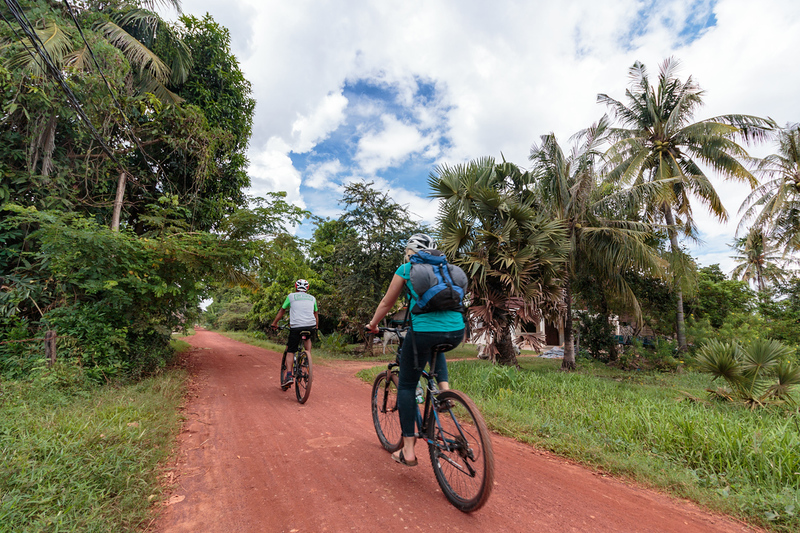 To get around the temples of Angkor by bicycle you can simply follow the cycling paths alongside the roads, or, if you have a mountain bike, take the jungle trails and explore a more hidden part of the complex. Keep in mind that Cambodia can be very hot and humid. Cycling around all day might be tiring if you’re not prepared. So make sure to brings lots of water, some snacks, and avoid cycling during the warmest times of the day. In Siem Reap you can purchase a reusable bottle by a company called Ecobodia and refill it at their partners shop and stations for free. 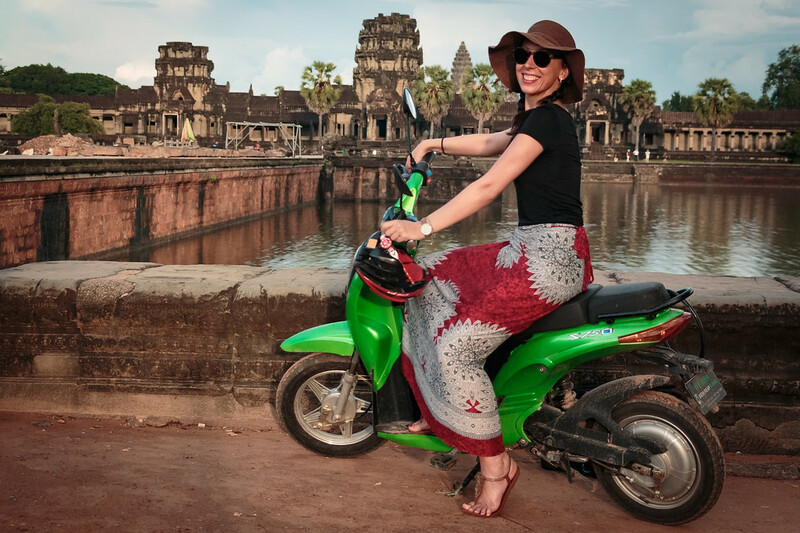 E-bikes are an even better way to explore the temples of Angkor sustainably. It is obviously less tiring as cycling and it goes faster. There are several companies that rent e-bikes in Siem Reap, we tried two of them. Ovelocity is an electric bike rental shop that offers e-bikes to visit Angkor for 8$ per day. The e-bike had a basket as well as a hook to hang a small bag which was super useful. They were super easy and fun to ride, we were going at an average of 25km / hour. What Ovelocity is great for compared to the other e-bike rental shop, is that they have a shop located in the Angkor complex. When your battery is dead you can go there and they immediately change your battery to a new one. With a full battery you can drive from Siem Reap until Angkor Wat, visit Angkor Thom, Bayon and go to the shop, then continue your Angkor tour. Roughly we were changing batteries 2-3 times per day, depending on how far we went. The only issue we had was that their battery changing station in Angkor is open from 9am to 5pm, which was not so convenient. We wished they could open earlier and close later. Note that Ovelocity shop also rents motorbikes. Siem Reap e-bike is an electric bike rental shop and tour company (Unique Adventure The Cycle Tour) located in the centre of Siem Reap and offering e-bikes rental for 12$ per day. The e-bikes are more recent and can go slightly faster, which explains the higher price. We could go up to 35-40 km per hour at first but then we kept a maximum of 30 km per hour in order to save some battery as it goes down pretty fast. The bikes have a hook for a small bag and pedals in case you run out of battery you can still cycle, but we didn’t have to use them. With Siem Reap e-bike, battery changing is made easy for you. When you’re about to run out of battery, you call them and they bring a new one. The only downside was that we waited more than 30 minutes to get the new battery and it felt a bit long. We had the good idea of waiting in a restaurant so it wasn’t so bad after all. Siem Reap e-bike rental shop also rents mountain bikes and organise fundraising events where profits go to the Children’s hospital. E-bikes are definitely our favourite way of going around the temples of Angkor as it has a low impact on the environment, you can go at your own rythm and you don’t get tired cycling in the heat. We highly recommend renting one, you will be doing the planet a big favour ! Although hiring a tuk tuk driver is not the most sustainable of options, we did it for the first day so we could get to the ticket office and to the Angkor sunrise without having to worry about how to get there. Hiring a tuk tuk driver to visit Angkor is the good solution if you really don’t want to get tired and if you want the comfort of being driven around without having to check your map at every turn. But, even if it’s comfortable it’s not the most exciting way to visit Angkor in my opinion. Not only is it polluting but it also takes away the feeling of freedom that exploring the temples by yourself gives you. Hiring a tuk tuk should cost you around 15$ per day depending on your negotiations skills. When possible try to share the tuk tuk ride with other people. Not only will you save money but it makes a big difference on the environment. 6. How much does it cost to visit the temples of Angkor ? I would highly recommend you to buy the 3 days pass or even the 7 days pass if you have more time, as it is only 10$ more. Angkor is a big complex and having 3 days within a week allows you to take breaks in between your visit and avoid temple fatigue. The ticket office is open from 5am to 5pm. You can buy your pass the day before the start of your actual visit, go to the ticket office at 4.30pm then head for the sunset, and it will not count as your first day. Tickets purchase require a photo that they will take at the ticket office directly. Purchases can be made with credit cards or cash. Entrance tickets must be bought at the official ticket office located next to Angkor Panorama Museum, on Road 60. Do not buy them from third party vendors. You will have to stop at check points for your tickets to be checked. The main one is on the road to Angkor Wat, your tuk tuk will know where to stop and if you’re cycling or driving an e-bike you will be stopped by the staff. Check out the official Angkor website for more information. Most temples are open from 7.30am to 5.30pm. Angkor Wat temple and Sras Srang are officially open from 5am to 5.30pm. But I did enter a few times at 4.30 am. 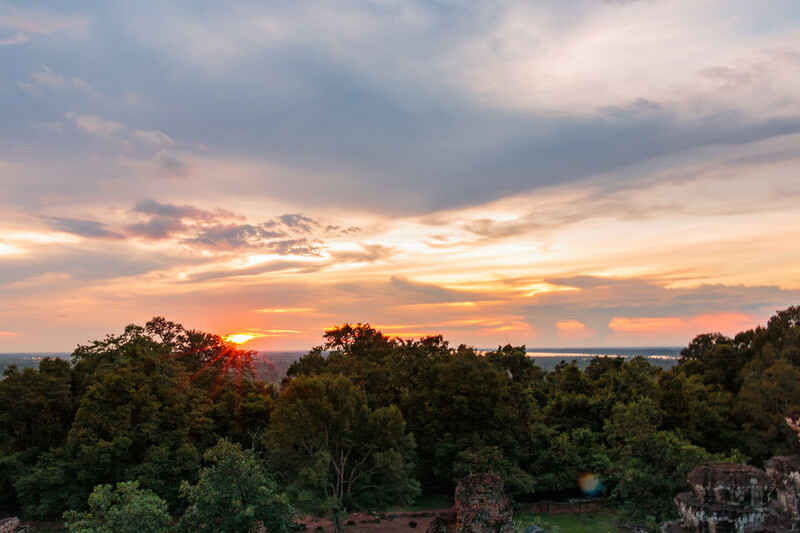 Phnom Bakheng and Pre Rup temples are open from 5 am to 7 pm as they both are popular spots for sunset. 8. 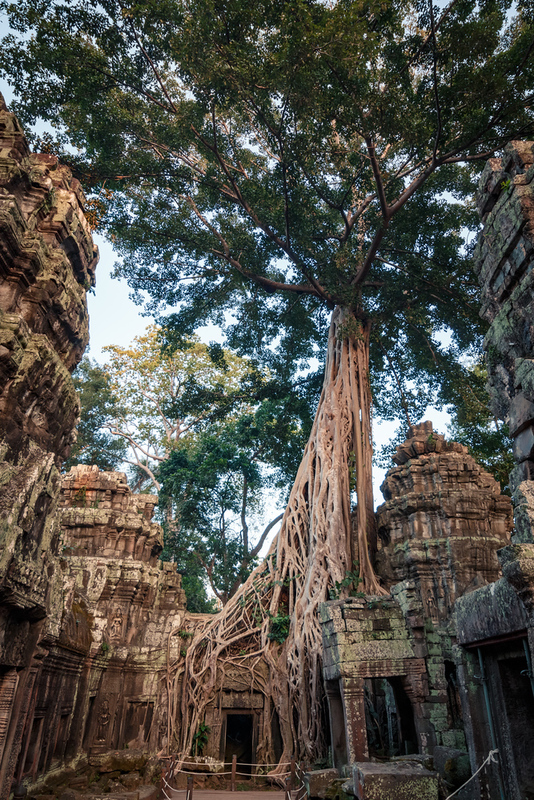 When is the best time to visit the temples of Angkor ? To visit the temples of Angkor, the peak season is from November to March, when the weather is cool and dry. But this also means there will be a lot of people. The temples are less crowded from June to October, but the weather is very hot and humid, and there are higher chances of rain. But it’s usually only a short moment during the day. If possible, avoid the sweltering temperatures from March to May. The months of July and August are a great time to visit, as the landscapes are emerald green, the moats overflowing with water, and the stones are beautifully covered in moss and lichen. Another great time to visit could be for the Angkor Wat International Half Marathon takes place annually in December. 9. 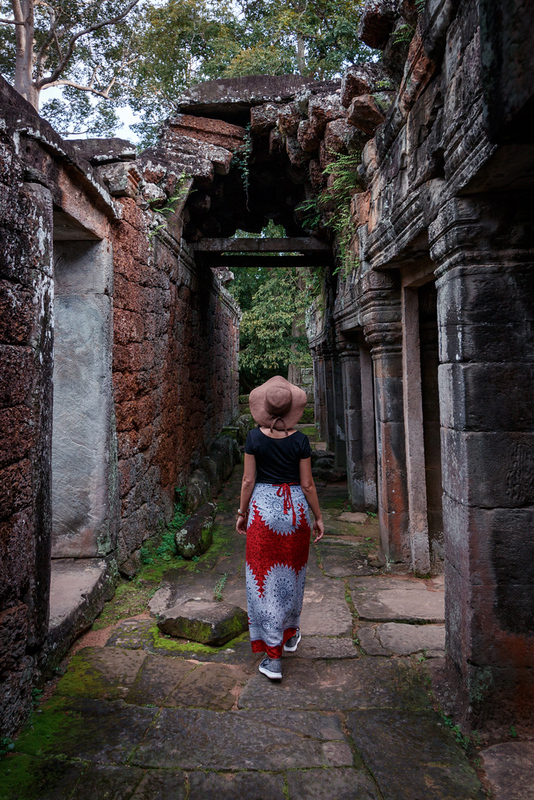 How to dress to visit the temples of Angkor ? Cambodia is usually cool and dry from November to March and hot and humid from April to October. But even during dry season it can rain and even during the wet season it can be very sunny. 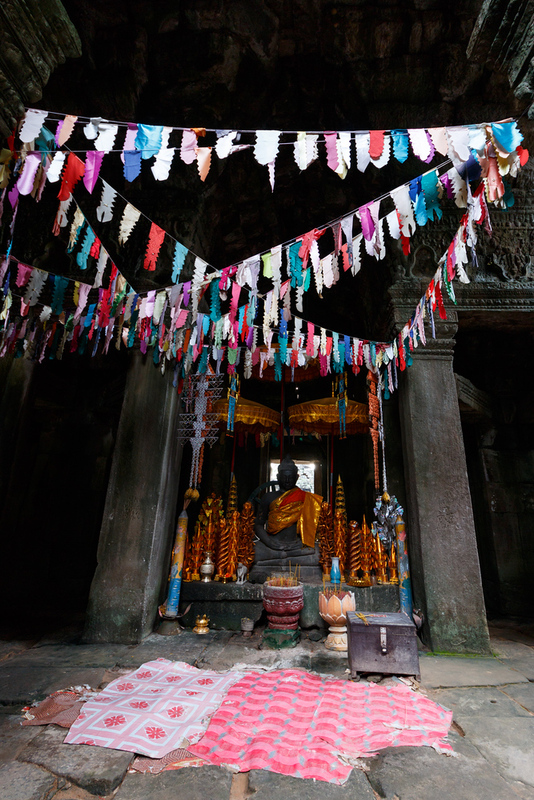 When visiting the temples of Angkor you want to be prepared for every kind of weather. You want to bring sunscreen, a hat and a pair of sunglasses. But you also need an umbrella and a rain jacket just in case ! You should not be wearing revealing clothes such as shorts and skirts above the knees and tops showing bare shoulders. Not only because it is a sacred site and it is forbidden but also because you want to protect your skin from the sun as well as from mosquitoes ! You should also bring insect repellent, you can easily find natural ones like citronella oil, they will be better for your skin and the environment. Make sure to bring good shoes, as you will be walking a lot. Angkor is still today an active religious site, with monks living here and Buddhist worshippers visiting. It is also a gem of our common heritage and we all need to show respect and preserve it for the future generations. Make sure to follow the guidelines of the Angkor code of conduct. Dress respectfully by covering your shoulders and knees. Do not touch carvings, sit on fragile temple structures or take archaeological artifacts. Be quiet. 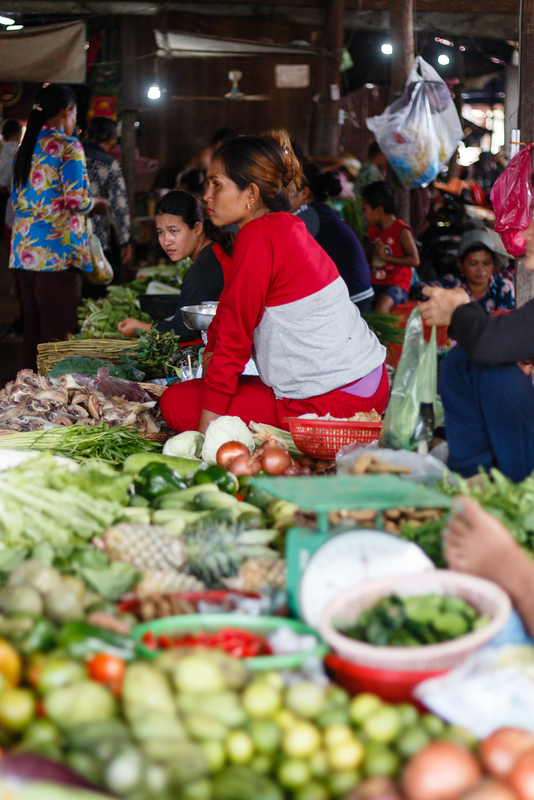 Loud conversations and noises are inappropriate behaviour in Cambodian culture. Do not smoke. Angkor is a smoke free site since 2012. Smoking cigarettes are forbidden as it can starts bushfires. Do not litter to protect the environment. Collect your trash and put it in the provided bins. Do not buy items sold by children or give them candy or money. It encourages them not to attend school. Ask before taking a picture of a monk. Women should not touch nor stand too close to monks. Siem Reap has a wide range of accommodation to suit every traveller. From hostels to guesthouses, budget hotels and luxury hotels, you won’t have any problem finding what you’re looking for. We stayed in this lovely guesthouse that offers big rooms with king sized beds and lots of storage space for 17$ per night (breakfast not included). They have a small pool and bean bags at the entrance and a rooftop terrace with an outdoor little cinema. Their breakfast are excellent and the couple that runs the guesthouse is lovely. 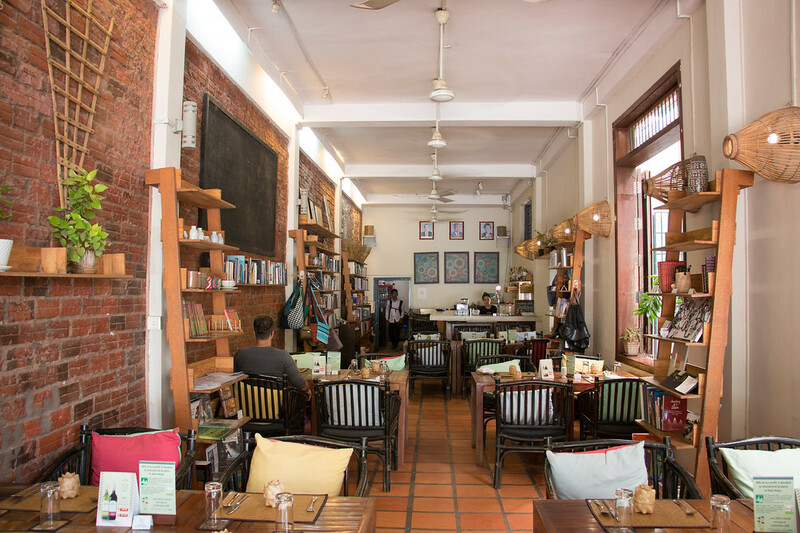 It’s located on Sok San Road, one of the most central streets, next to the night market and within walking distance of many restaurants and bars. If you’re looking for something more luxurious then Bavyra Boutique d’Angkor will please you. This well designed boutique hotel offers huge rooms with a little kitchen area, balcony or a terrace overlooking the big swimming pool. The rooms are usually around 40$ per night but we got an amazing price (19$ per night !) by booking on booking.com. The hotel is located North of town, about 5-10 minutes cycling to the central part of Siem reap and they provide bicycles for free. 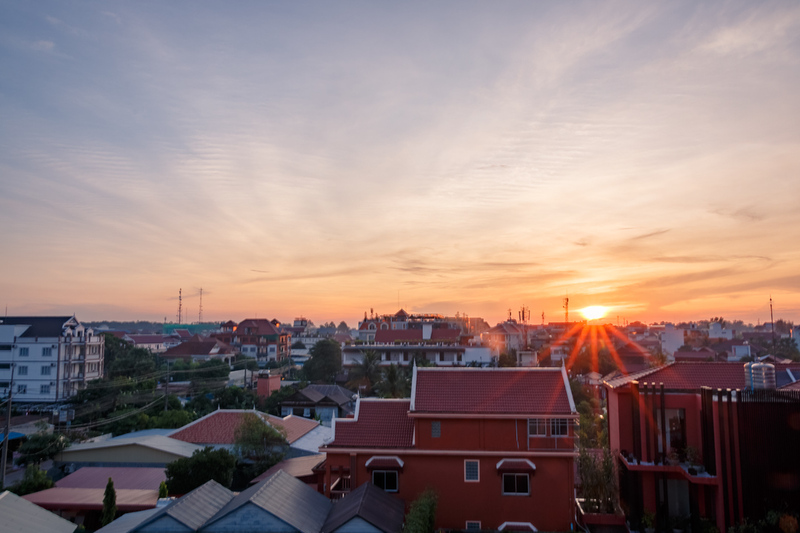 It’s a great location to visit the temples of Angkor as it’s on the way, so it means you can stay in bed later ! We didn’t stay at those places but they were either on our list or recommended by other travellers. European Guesthouse : Cheap eco-friendly guesthouse with a swimming pool. Sweet Dreams Guesthouse : Basic but clean rooms. Lovely Guesthouse : Basic but clean rooms. Nice staff. La Maison du Passant : French – Cambodian lovely couple, great location on the way to the temples, swimming pool, great food at very affordable price. Overflow Guesthouse : Very nice guesthouse a bit away from town but offering great rooms. Mango Rain Boutique Hotel : A bit further away from town but a very affordable boutique hotel. Amra Angkor hotel : Great rooms for under 25$ per night. Visas on arrival can be obtained at international airports and border checkpoints. Tourist visas can be requested online before departure. Make sure to allow enough time to get the visa before your departure. Tourist Visa on arrival : 30 $ (cash only), 30 days, extendable 1 time, documents needed : 1 passport-size photo. Online visa : $ 37 dollars, 30 days, processing time: 3 business days. 1 passport-size photo in digital format, a valid credit card. You will receive your visa by email and will need to print it out. You can purchase a Cambodian prepaid sim card anywhere, at airports and cities, you just need your phone to be unlocked. The two most popular network providers in Cambodia are Cellcard and Metfone. We got a Metfone sim card for less than 10$ for 4go data for 1 month. Cambodian Riel is the official currency, however the US dollars is mostly used for big amounts. Small change will be given in riels. In Cambodia 1 dollar equals to 4000 riel, although the official rate is almost 5000 riels for 1 dollar (2017). So it will be at your advantage to pay in dollars, and not in riels. Be careful, torn dollar bills are not accepted, as well as two-dollar bills and dollar bills printed before 2006. ATMs will give you US dollars and will all charge 5-6$ depending on the bank. Canadia Bank isn’t free of charge anymore. I hope that you found this guide to visiting the temples of Angkor sustainably informative and useful, and that it will allow you to plan your own visit there. Let us know what you think !! Don’t forget play with the EXPLORE menu for extra content : travel tips, awesome pictures, interviews and more !